This is a tri-fold birthday card I had made for my sister. I'm a novice at this and have no professional material or training at all.. ..nor can I find much around where I live ( so please bear with my untidiness :) ). - Card itself is made from dark purple -cardboard paper. - Flowers, I made from scratch from dark purple and lavender cardboard paper, in the center of the flowers are amethyst beads. - The floral backgrounds are paper sheets which I had and I lined them with glitter. I stuck a beautiful mauve floral little note and tied with a silver ribbon. Hi i am rachana:) Its very nice.. i liked it :) and its very neatly done.. I just found your lovely card. 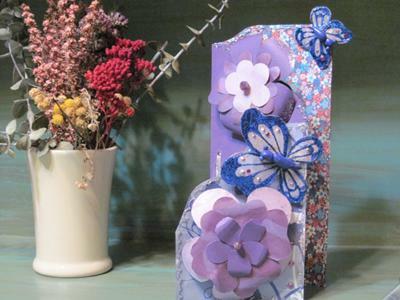 You are very creative and have coordinated everything into a beautiful card. I'm sure your sister will love having the fridge magnet to remember this card. You have given me an idea for making my grandson's birthday card. It will have a super hero theme where I can use your tri-fold and magnet ideas. Perfect. I had not thought of that before. Its an awesome card! Elegant and finished yet very rustic and handmade. I love the magnet idea. Keep up the good work! !